American public school students have fallen far behind other developed countries in basic skills: reading, math science. In one respect, though, we’re still number one: American students have the most confidence in their scholastic abilities. Johnny can’t read or add, but he has boundless self-esteem. Is the glass one-third full or three-quarters empty? Would Johnny know the difference? More than other recent biopics such as Ray and Kinsey, which made a show of “warts and all” even-handedness even as they softened the reality, Walk the Line dares to allow its protagonist to be genuinely unsympathetic. Like its heroine Jamie, A Walk to Remember is pious, wholesome, and eminently open to mockery and derision. Also like its heroine, it doesn’t care what people think of it. 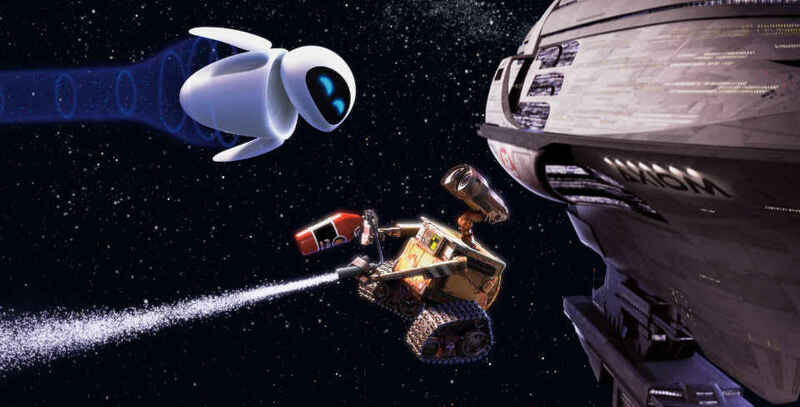 Even Pixar has never attempted anything on a canvas of this scale. From Monsters, Inc.’s corporate culture to Finding Nemo’s submarine suburbia, previous Pixar films have never strayed too far from the rhythms of real life. … WALL‑E creates a world that, despite clear connections to contemporary culture, looks and feels nothing like life as we know it, with unprecedented dramatic and philosophical scope. In War Horse Spielberg harkens back to an earlier cinematic age, creating something more like a Golden Age Hollywood epic than any film I’ve seen in years, the one other notable example being Baz Luhrmann’s Australia. Here’s my 30-second take on War Horse. Warrior opens with a rash of Christian iconography and references: a Pittsburgh church adorned with Eastern-style three-bar crosses from which we see Paddy Conlon (Nick Nolte) emerge; a rosary dangling from his rearview mirror as he drives home to discover his estranged son Tommy (Tom Hardy) waiting on the stoop of his house; a Bible that Tommy contemplates on Paddy’s table. The open-mindedness of the young obviously imposes a huge responsibility on parents to watch what their children are exposed to. But it also represents a tremendous opportunity to expose children to valuable and worthwhile experiences that for many of their peers will be lost, possibly forever, by the time they are teenagers. Newly remastered for Blu-ray and DVD, the classic animated adaptation of Richard Adams’ beloved tale is available from Criterion. Is there grace for such pilgrims as these? Perhaps, but it may not take the form they seem to be seeking. At the end of the road, some viewers might feel let down at what has not changed for the main characters, but perhaps this is to miss the change that matters most. Emilio has said that the film is “pro-people, pro-life.” So it is, in more ways than one. More than most films of its ilk, We Are Marshall rises above the clichés that define the genre, connecting sport to larger issues in an emotionally satisfying way. I don’t expect animated heroes to have uniformly ideal, harmonious family lives. It’s not realistic — and it doesn’t make for good drama, which needs conflict. The ubiquity of the pattern, though, is striking.